In Cenote City, all the hospitals have been shut down and replaced with weekly mobile clinics, impacting its residents, animals, and ecosystems. To earn income, the hospital nurse, Marcrina Lopez delivers the dead infants of women who can’t afford to leave the valley to give birth. She is eventually inflicted with an immense crying curse, becoming a ward of the city and a nighttime tourist attraction. In this flashback section, her daughter, Lune recalls how her mother joined a collective to protest the unjust treatment of poor black and brown hospital patients. This lead to the government’s closure of the hospitals and an end to her family as she knew it. When my father told my mother he was leaving her, she had been one of the most active women in the protests against the hospital. He had been waiting to leave her, but he wanted to wait until she could make it on her own, until she had her own money and her own friends. He told her that he was going to leave her on Christmas Eve. The morning before he told her, they had argued about an old Christmas box that my mother insisted on keeping. The box held a long-limbed elf and dried apple ornaments that were sewn to look like the faces of old Mexican women. All of their eyes had been chewed out by rats but my mother had insisted on keeping them and began to cry when my father had threatened to throw them away. Christmas Eve, my mother was wearing a black silk dress and my father was wearing a black silk shirt that had been made by Dr. de la O’s husband, who was a tailor. My mother had them made especially for the hospital garden party. She looked like a black river at the party, a brilliant black beetle when she walked through the leaves of the flowers, the silk in her dress rippled like liquid under the hot air that blew from the heaters, bits of silver swimming under the glow of lights. Blue lights braided with purple lights hung over them like a pendulum and the string of lights would only move when the band played a particularly slow song. My father danced with my mother that night. My mother’s lips were painted over with oxblood, a gift from a patient, an old woman that had lived in New Mexico when she was a girl. My father kissed my mother’s lips and tasted the animal’s blood and it tasted like one thousand little stars in his mouth. He didn’t like the taste of it because it reminded him that she would never be his. That she would never really belong to him. He knew that he had been foolish to think that they would last, that their daughter would keep them together. My father thought of me, asleep under the Christmas tree in my black velvet gown and ribbon in my hair. He took a long breath of the cold foggy air to strengthen his resolve. The lights above him blinked on and off. My mother and father danced and danced and other couples flew around them in circles, the violin sounding the loudest over from the band, a white Christmas tree towered over them, decked with hundreds of cuckoo clocks. The birds would emerge on the hour and sing their song. This city used to be called Flute. That was our city then. That was the hospital garden. My father whispered in my mother’s ear, his voice on her neck. He was leaving her. It was Christmas. It was her gift. He wouldn’t burden her anymore. She could be free now. He said. She could be committed to the cause. She could stay out until the early morning, the sky would bleed pink just for her, just like the mouth of that bird cooing in her other ear. He grabbed his love like a bracelet and told her to remember his words when she felt like she was lost. He loved her completely. He would be gone before morning. Dr. de la O asked if she could cut into their dance, her hot pink tequila lips cutting the cold sky in giggles and Lune’s father obliged her. He only stayed a moment, long enough to see his wife’s eyes stained, not with a deep shade like the oxblood, but another shade of blood. Her eyebrows were like thin puffs of smoke that might evaporate in the fog and the mist. She lay her head on de la O’s shoulder and drowned. My father made his way out of the hospital garden as the band began to play a new song, as the hospital workers began to clink their glasses to a toast. All of this was a disguise. A mask to hide their rebellion. A fistful of dust flung in the eyes of their enemies. The flowers bent low and tangled, their leaves specked all over with tiny red lights, like a million eyes, not bright enough for my father to see a clear path to where he was going, but not dark enough to turn back and stay with my mother. He thought he heard her call out to him, her voice as small and beautiful as it always was, but that fragment of her voice lay hooked inside the call of the cuckoo birds, glowing and shaking under the moonlight. My father knew what his wife was doing. She wanted to save the sick. He saw the good in it. He kept looking for more and more glow lights. He was just looking for a way out of the garden. 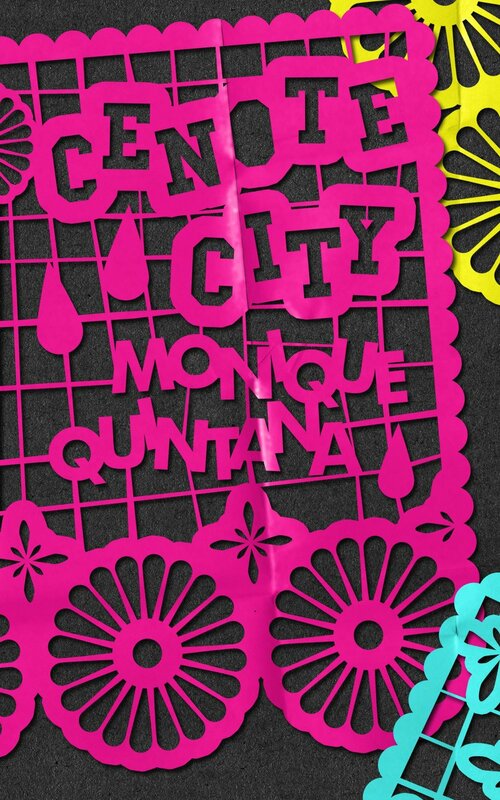 Monique Quintana was born and raised in the Central Valley, “the other California” and holds an MFA in Creative Writing from CSU Fresno. She is a Senior Associate Editor at Luna Luna Magazine, Fiction Editor at Five-2-One Magazine, and a contributor at CLASH. She blogs about Latinx Literature at her site, bloodmoonblog.com, and her work has appeared in Winter Tangerine, Queen Mob’s Tea House, Grimoire, Huizache: The Magazine for Latino Literature, and The Acentos Review, among other publications. She is an alumna of the Sundress Academy for the Arts and has been nominated for Best of the Net. She is a Pocha Xicana and still working on herself. You can find her at moniquequintana1@gmail.com.